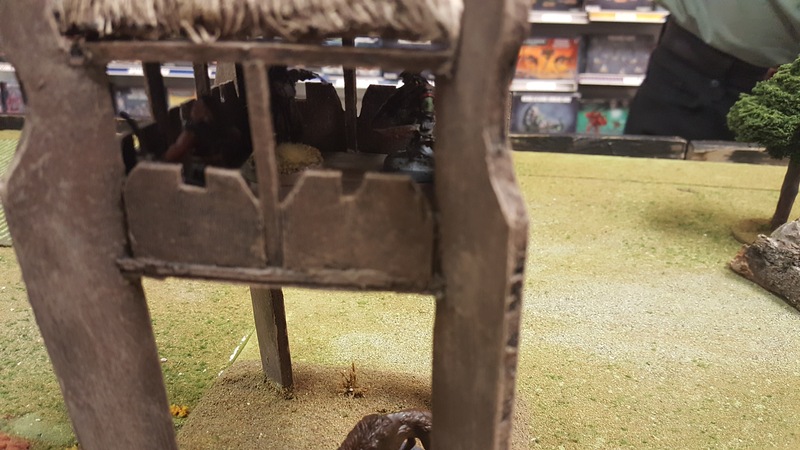 As the sun rose slowly into the morning sky, Dhatta came back into the run down farmhouse the warband had been staying in. 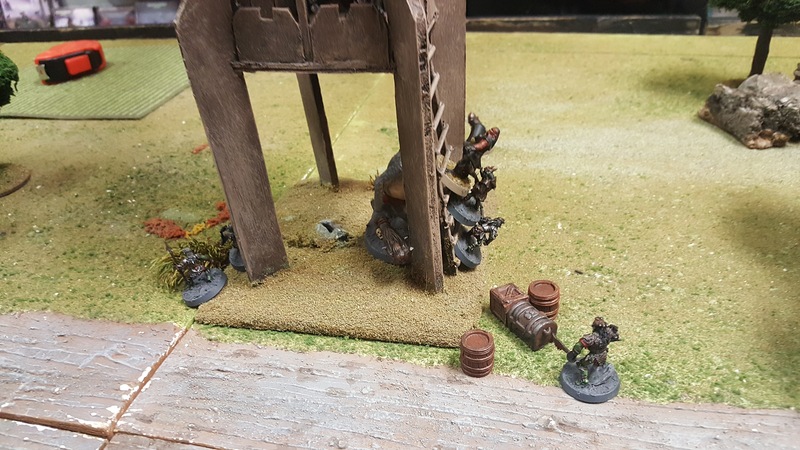 For two nights they had held up, mending their wounds and repairing damage to their gear after the battle outside against the dwarves. 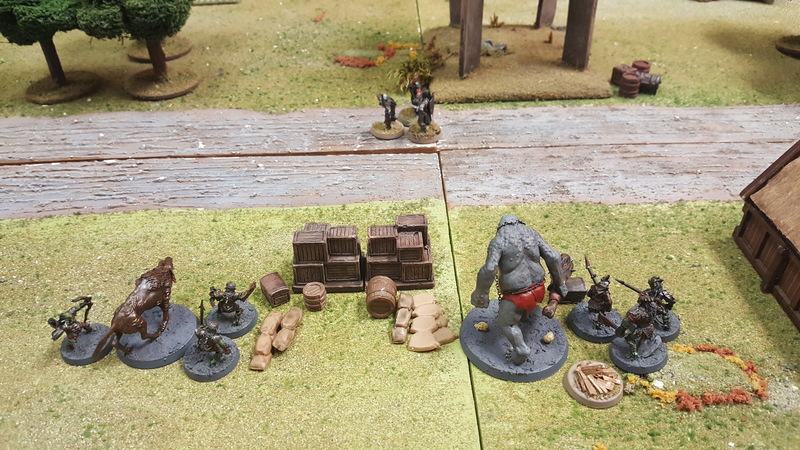 The troll had already eaten a whole pony left behind in the dwarves fighting withdrawal, while the rest of the party was making due with scraps they still carried with them. They would need to get on the road and through Mirkwood soon or they would quickly run out of supplies. This was game 2 of the day against Simon, this time using his evil Uruk-hai BC! 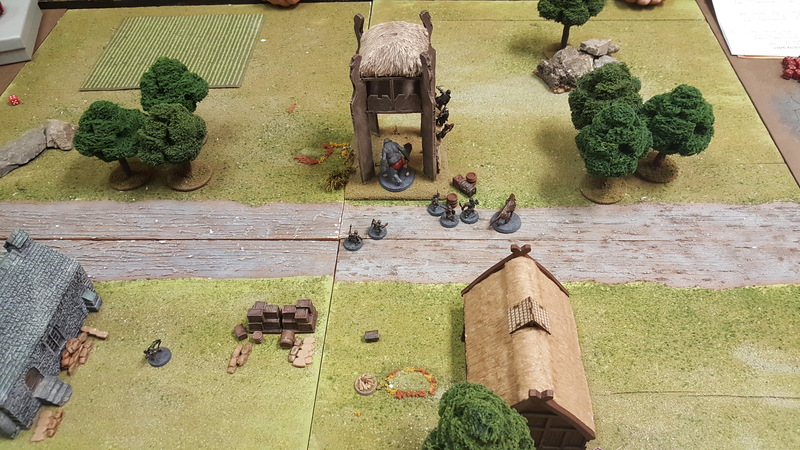 They were already fairly reduced in number due to a previous battle against some ferocious Hobbits (yes, that’s right) and now had to survive an ambush with only 3 of their party starting just far too close my full force! 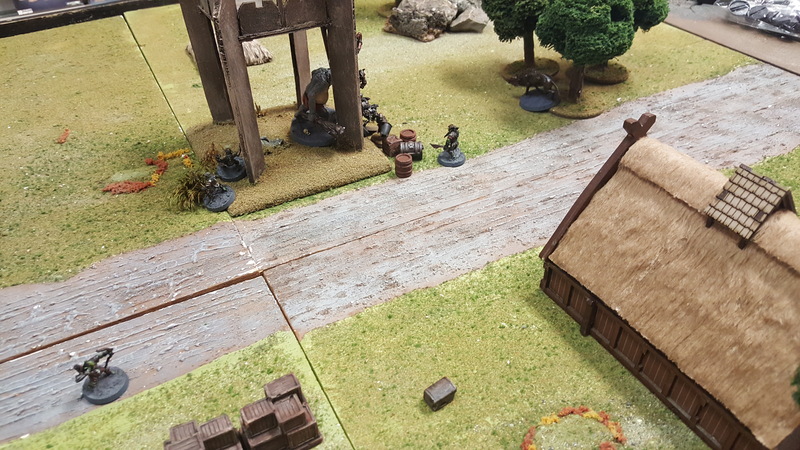 This mission sees one side (defenders) have to put a single hero, and any 2 other models from their warband, right in the middle of the board. 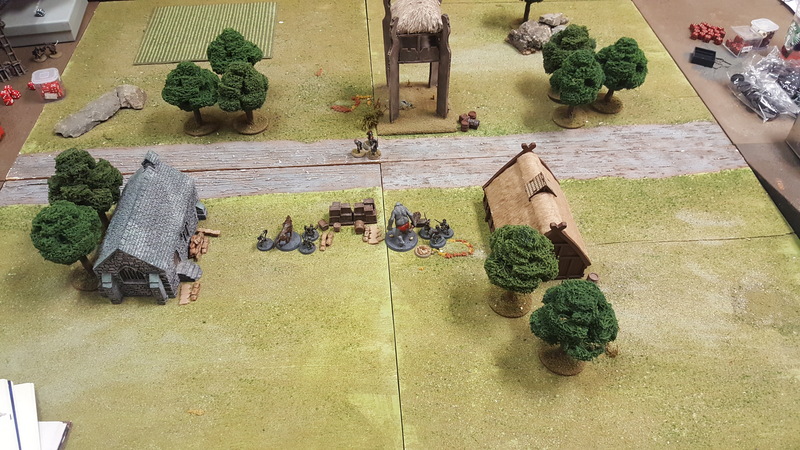 The other team (attackers) then sets up their own full party anywhere within 18″ of their board edge (leaving you very close to the enemy)! The person defending has the rest of their team move on from the board edge on the first turn. Game ends when the defending hero is slain, or if the attackers reach 50% casualty. In what could have been disaster, Simon took flight for that watchtower from the start! 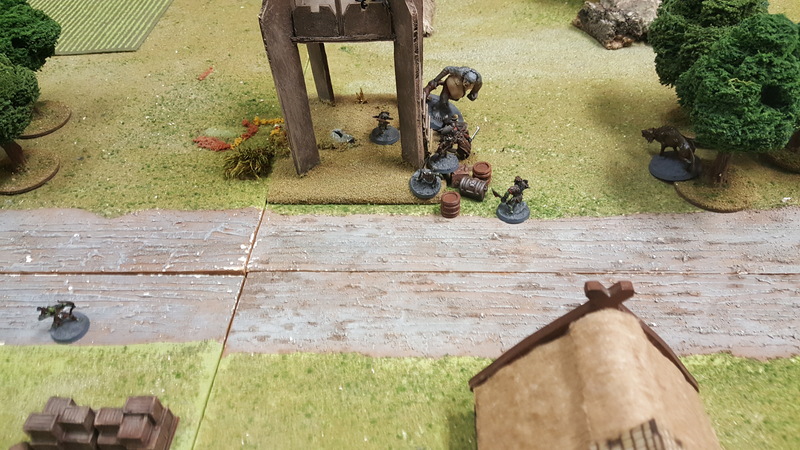 Luckily for him he was able to do a heroic move and get out of my charge range on turn 1, and being Uruk’s they can move faster than myself, getting much needed distance. I had not even anticipated this move at all and could have set my deployment up differently had I realised this option…drastically changing the outcome. I quickly gave chase but also tried to keep a bit of a spread between my units to be able to react to his incoming reinforcements. The dice were certainly not no my side either and I could do little to stop him even when I did get into contact! 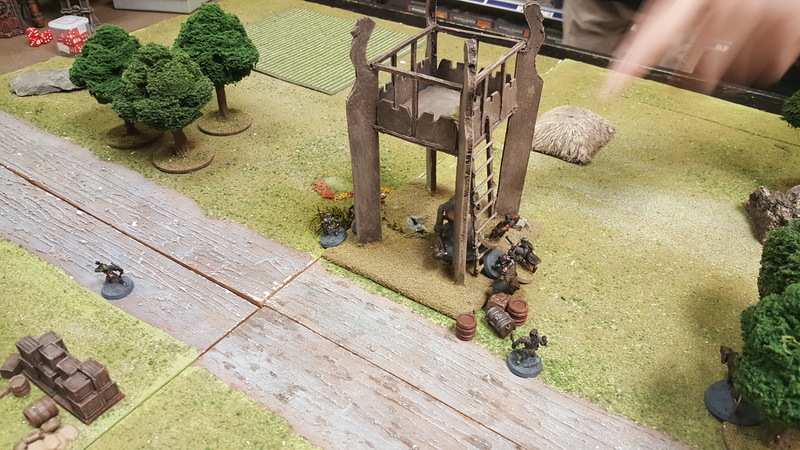 Things got messy on the ladder quickly as we had to figure out how to do combat on it with something that looked straight out of a Monty Python skit. In the end I managed to knock one of his lads off, who then fell down on top of both my guys! Poor Na’tasha’yar couldn’t even push the bloody thing over! 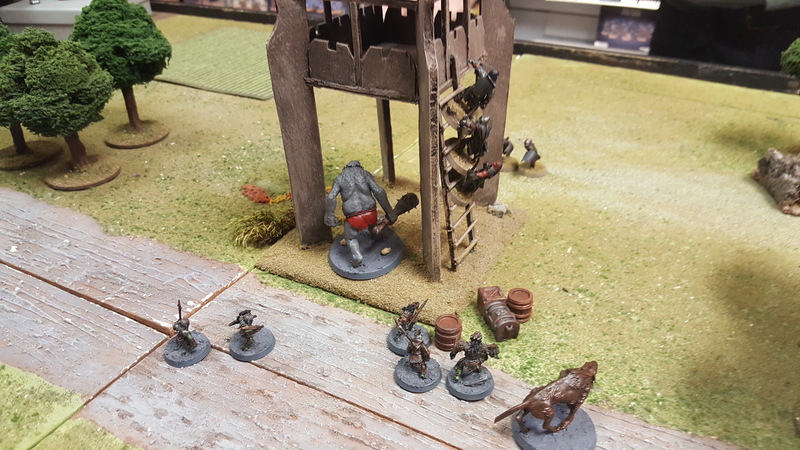 One of the Uruk’s was stabbed in the hand, losing its grip and tumbling down the ladder right into the goblins at the base. As the Uruk rolled off the two goblins that broke its fall it rose just as a club the size of a tree trunk smashed it from its feet sending it flying backwards to land in a clump of crushed armour and bone. The other two Uruk-hai caught up to the fray now and came swinging, quickly knocking down Whez’lei and taking him out of the fight with a shield blow to his head. 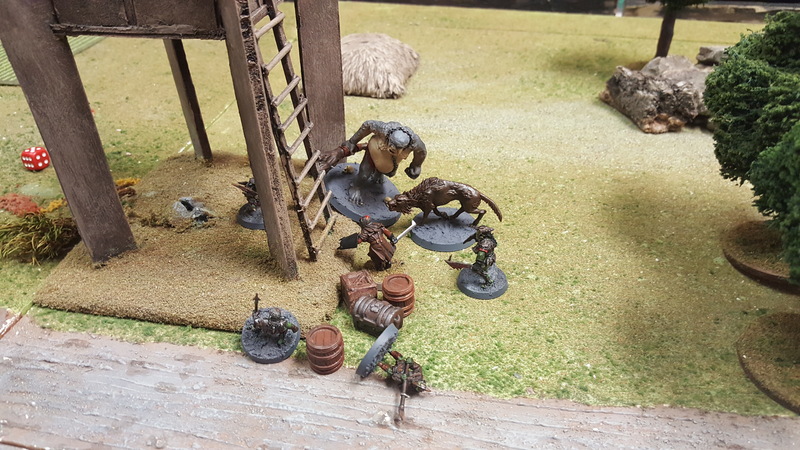 However, they quickly found themselves surrounded by goblin and troll alike and were beaten down into the ground faster than their great skill warranted. Whorf, Dhatta, and Pikhard all began scaling the watchtower to try and get at the final Uruk’s hiding at the top. Their years living deep within the Misty Mountains making them very agile climbers. 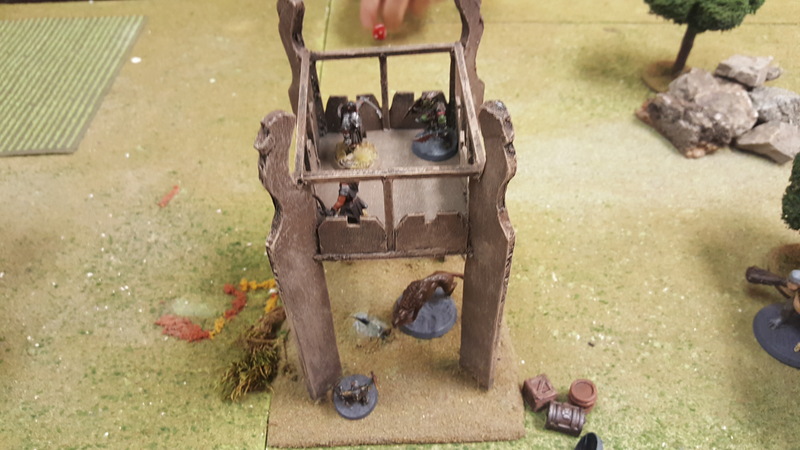 However as each one neared the top they found themselves face to face with a foe triple their size swinging savage blades at them as they held on to the wall and tried to fight at the same time. Whorf duelled with the enemy leader back and forth, both landing blows on the other as they fought for their lives. 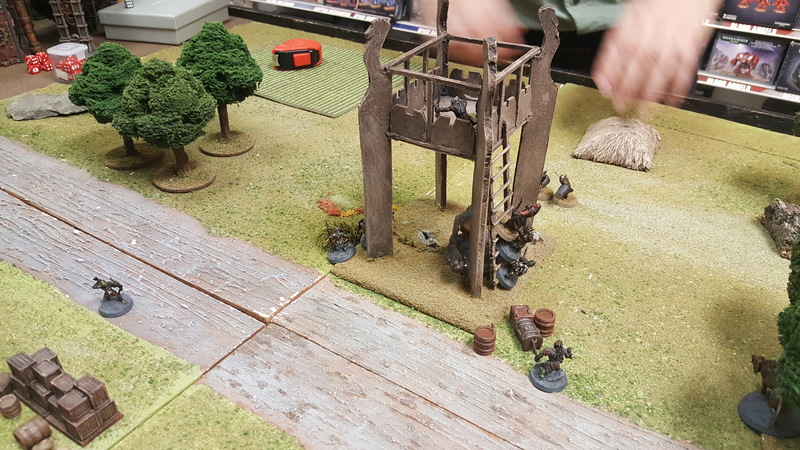 Pikhard managed to get up and into the watchtower behind the enemy leader just as he dispatched Whorf off the railing with a might kick from it’s armoured feet. Pikhard leapt onto the back of the Uruk leader, biting and clawing at him trying to pull him down. As the Uruk leader tried to get a grip onto Pikhard to throw him off, the other Uruk finally knocked Dhatta off the other side, catching him with a punch to the temple and toppling him to the ground below. 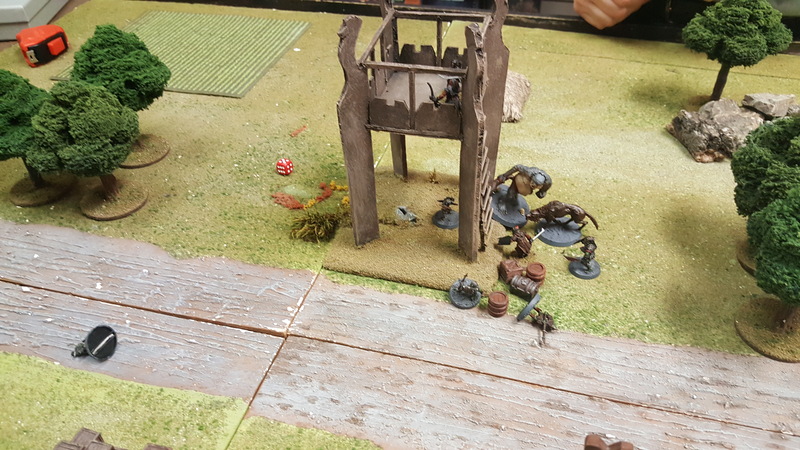 The Uruk leader pushed backwards slamming Pikhard into a support beam on the corner, knocking him down and causing him to briefly forget where he was. Just as he began to stand and regain his wits, he saw both the enemy Uruk’s leap from the top of the tower to the ground below. In a masterful display, Simon managed to keep his force alive and whittle me down to that 50% needed to end the game! His gambit of using the watchtower paid off as I could not get my numbers to work, nor my big hitters anywhere near him! I would call it a masterful strategy but Simon being the humble man that he is said it was just luck and he had no idea what else to do! He certainly made the right choice. It was fight or run, and running would have just seen him die tired as my larger numbers would be able to fan out and encircle him. All around it was a fun game though and very nail biting as it came down to trying to keep my last goblin alive and get his leader! I was lucky as usual and took no wounds or deaths however! The part still gained some influence and I used that to purchase a new warrior. I rolled a warrior with shield, giving me another solid goblin fighter! Dhatta managed to gain enough experience and became a mighty Gundabad Blackshield giving me a much tougher goblin to help hold my lines. I also purchased heavy armour for Whorf, who with a shield and then rolling a +1 D, saw him, a regular goblin warrior, at Defense 7!! Eat your heart out ya bloody dwarves! So say hello to the newest member of the team, Regh’inhald Bhark-lei! Oh I am loving this man. This has scratched an itch that I’ve been waiting to fulfil since I played Necromunda as a kid all those years ago. I hope you enjoy your book and games! I’m looking forward to them arriving – especially after reading your batreps!